Keep practicing and all is coming, guru Sri Pattabhi Jois inspired us among years to stay dedicated with your own practice. Great effort of practicing yoga must be supported with high quality yoga mat that keeps you balance, stable, for the whole session. And there are plenty of yoga mat brands with their uniqueness. The latest one and fresh from Indonesian creator/ yoga enthusiast are Lana yoga mat. Create by Syntha, Bowo and Ines, two yogis from Bandung, they started to develop biogradable/ eco friendly yoga mat, Made in Indonesia. Lana in sundanese means eternal, and so is the mat. " Since the begining, we're looking for bio degradable mat and eco friendly, and we're fit the rubber, mixed with PER, to make the rubber more sustainable, you can use it forever because it is pretty solid." says Syntha to YII, in Jakarta. Lana mat is made by yoga enthusiast for all yogi, the ashtangi, vinyasa power addict, or even yin lover. " Lana mat is thick. As far as we've seen, regular yoga mat very bland, so it hards for balancing pose. Well, even if we fall on it, it still hurts because not protecting the bones. " Syntha explain. Lana mat is 4mm, from rubber mixed PER, suitable for any yoga class, ashtanga, hatha, vinyasa, power, you named it. " 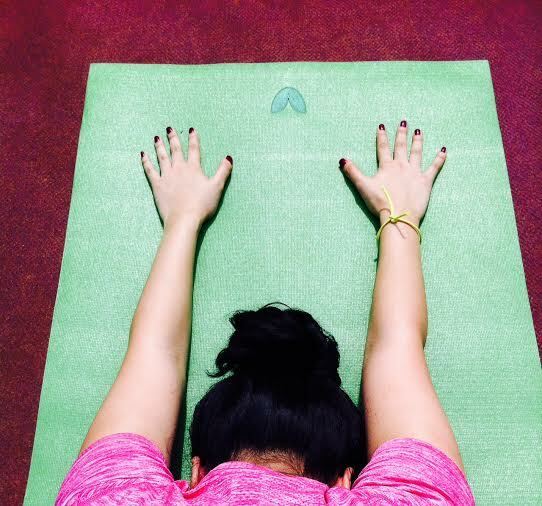 We're fit for any balancing pose, solid grip, anti slip, because this is great mat." add Sytha. For now, Lana is only available through online purchase at mylana.co, Lana is also available in Sana Studio. Lana mat now only have one color, green, the green mat of Lana, priced is Rp 774.500. This pretty lana mat is limited edition, so make sure that you'll get one and support domestic products!